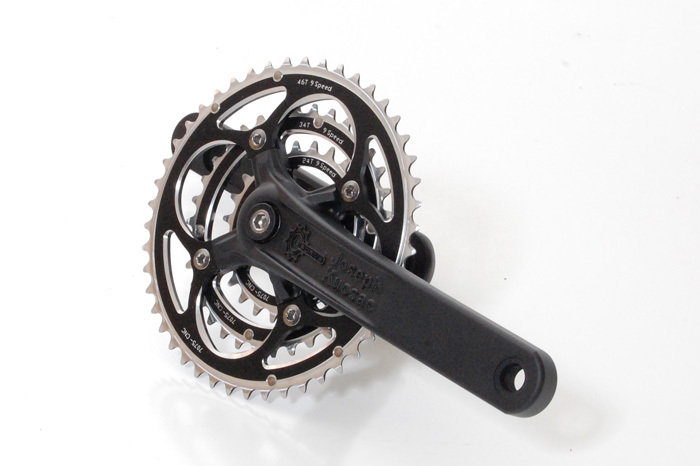 The Joseph Kuosac or JK mountain bike cranks are a great entry to mid levelcrank for the tall rider. We are stocking 190mm, 200mm, and 210mm and we can get any size from 130mm to 220mm. These cranks are forged aluminum and hold up very well. They come with an ISIS bottom bracket, and you can add any chainring configuration you want. These cranks use a 64/104 4-bolt chainring spider, and will work with 3x9, 3x10, 2x10, 2x11, 1x10, and 1x11 chainring combos. Special orders can be made, and will be added to our stock orders. That means there may be a wait time for a size we don't carry.